If you've purchased a computer or technology magazine sometime in the past 3 years, you've no doubt seen a full page advertisement for iBUYPOWER. They are a system builder that has an impressive array of computer that feature the latest hardware and can be configured pretty much any way you choose. iBUYPOWER is an interesting company as their high-end products can be tweaked and configured into some incredible configurations, but they also offer some great pre-configured systems that should fit into the budgets of many consumers. We stopped by their booth to check out some of their latest wares and to see what is new for 2011. 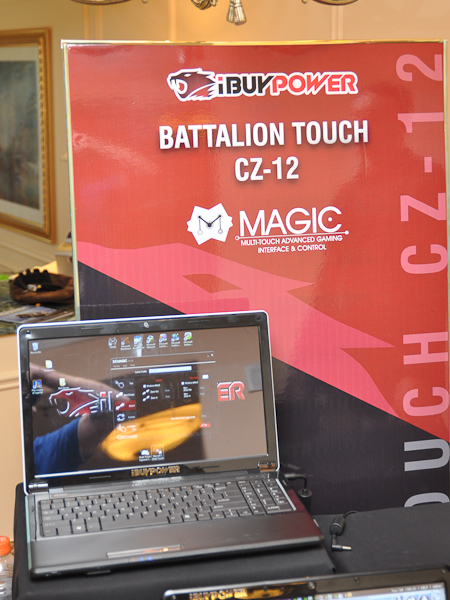 As we walked into their suite, we were greeted by a display of their new CZ-12 Battalion Touch laptops. These will be available shortly with the new Intel Mobile Sandy Bridge CPUs. This will give them pretty impressive performance and some will even be available with NVIDIA Optimus graphics for that extra performance. As a touch-screen computer is not necessarily the most handy thing on the market for gaming, iBUYPOWER has developed a way to assign macros to touch-screen gestures making it easier to play games like Supreme Commander on a touch-screen PC. They gave us the demo and it looks pretty interesting. iBUYPOWER uses a lot of NZXT technology - including cases, power supplies, lighting and other accessories. They aren't afraid to use other cases or innovate on their own stuff as well. They have built a pretty custom system that uses a full 10x worth 120mm. This offers some pretty impressive cooling potential in a case that is massive. If you can overheat your hardware in this case, you need to lower your voltages. The Erebus is a piece designed to show that iBUYPOWER can make things happen. 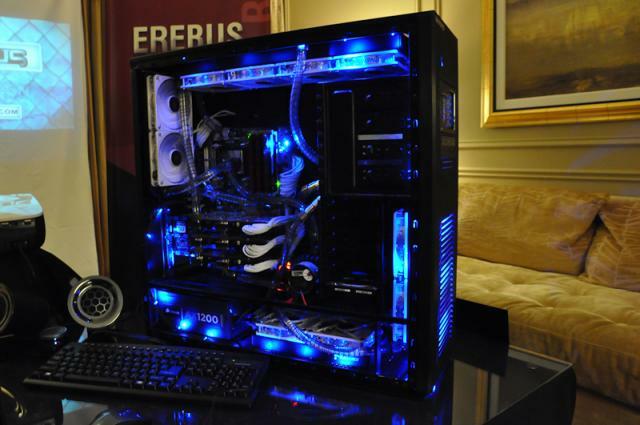 This is an over the top system that features 3-Way SLI and an unreleased Intel Engineer Sample CPU. It was running very quiet and quite cool. It should. That's a lot of radiator. NZXT has a couple of items in the suite that are NDA, but one of them will be launching very shortly. Still, some good stuff coming from both of these companies. Our full Day 3 CES gallery is located over here and has more pictures from the NZXT and iBUYPOWER Suite.